I've put together this framed painting, and there is a story behind it. In the late 80s and early 90s I worked in a Latin American Institute at a university and traveled throughout the region. 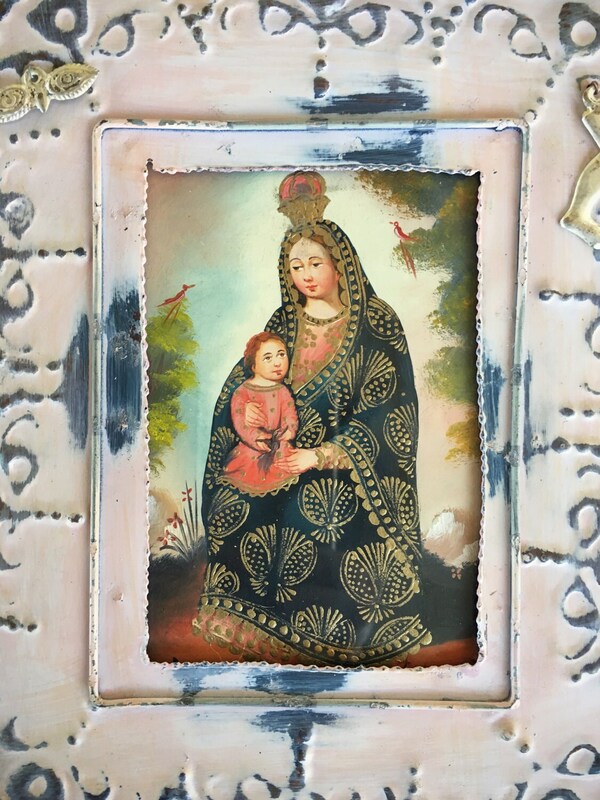 While on a trip to Peru, I bought a beautiful little oil painting on canvas--the one here--inside of an equally gorgeous and quite ornate wood frame. 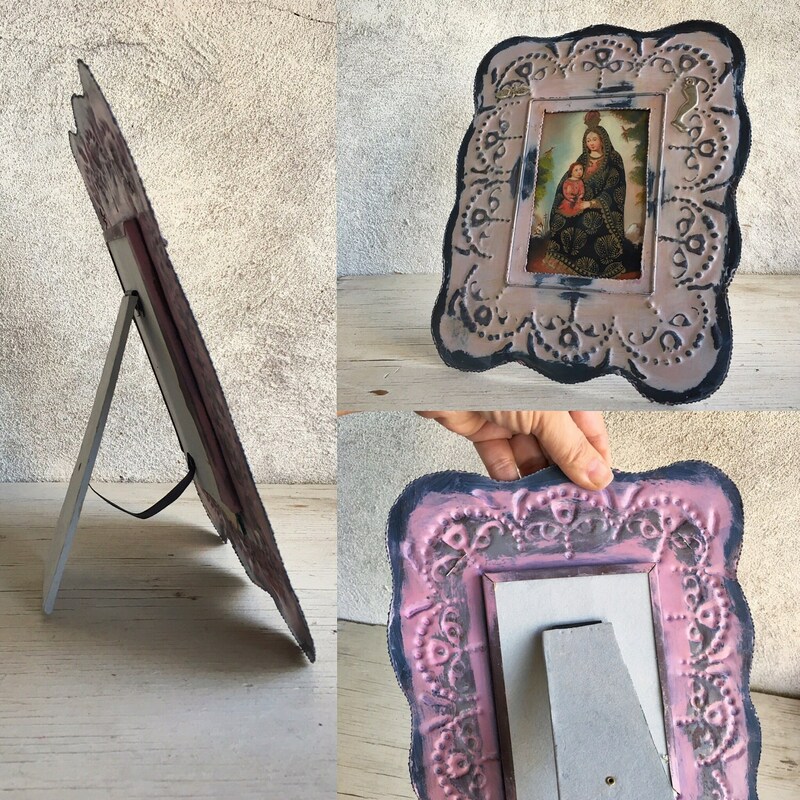 The piece sat with my "retablo" collection for years. 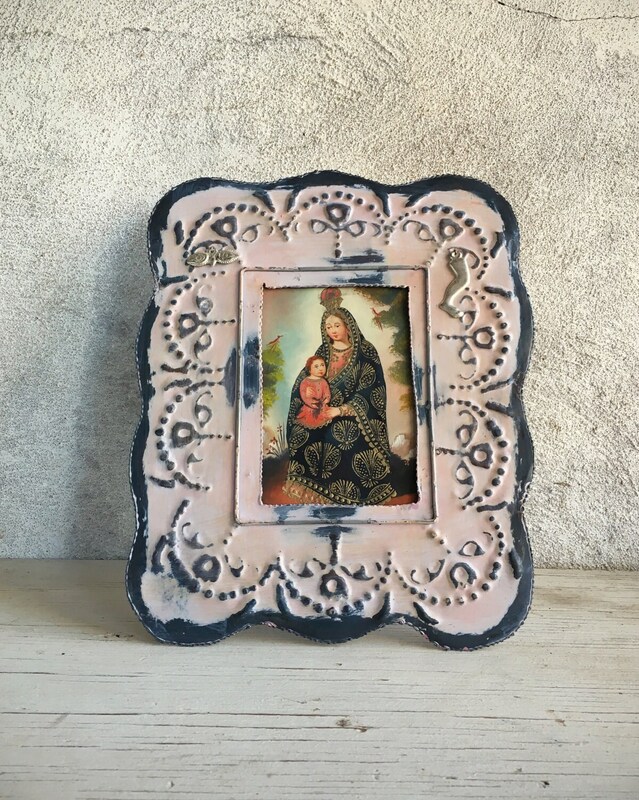 Well, as I've been selling off bits of my personal collection, I decided to take the Madonna and Child in wood frame to my brick and mortar store and hang it on a wall. One of the problems with having an item in a store is there's always a chance it might get damaged, and sure enough, the framed painting was dropped, the wood frame cracked and broken, and a wee bit of scuffing on the canvas. So, I brought it home, quite sad, and it sat for a while as I tried to figure out if the frame was salvageable. Then, lo and behold, I came across the most delightful old tin frame, the opening slightly small for the painting yet the effect just stunning. The old frame, and we know it's old because the front is quite faded from time (you can see the original color of pink on the back) had two small holes at the top. It is Mexican, and the holes potentially could have held wire for hanging, but I like to think they were there to hold devotional charms--milagros. So I added in two--an eye and a leg. And then I slipped the Peruvian painting into the frame. So this neither Peruvian nor Mexican. It is Latin American, and reflects the beauty of Hispano Catholic art. So if you're a purist and want to own a Cuzco painting within a Peruvian frame, this is not the piece for you. 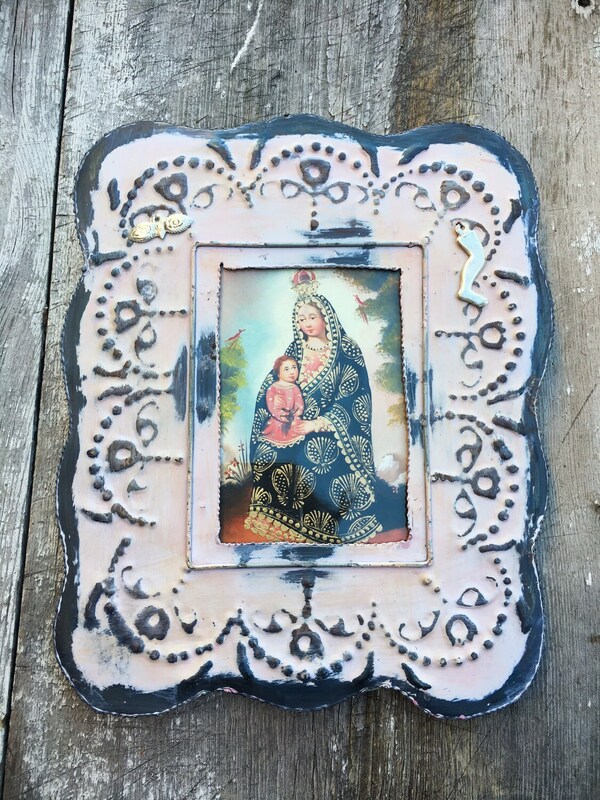 Likewise, if you had hoped for a tin frame with milagros and Virgen de Guadalupe--who this saint pictured is not--then again, the piece is not for you. But if you love beauty and revere the way in which it manifests in our culture and our art, and you love the magic that can happen when you mix it up, then yeah, this is your piece. 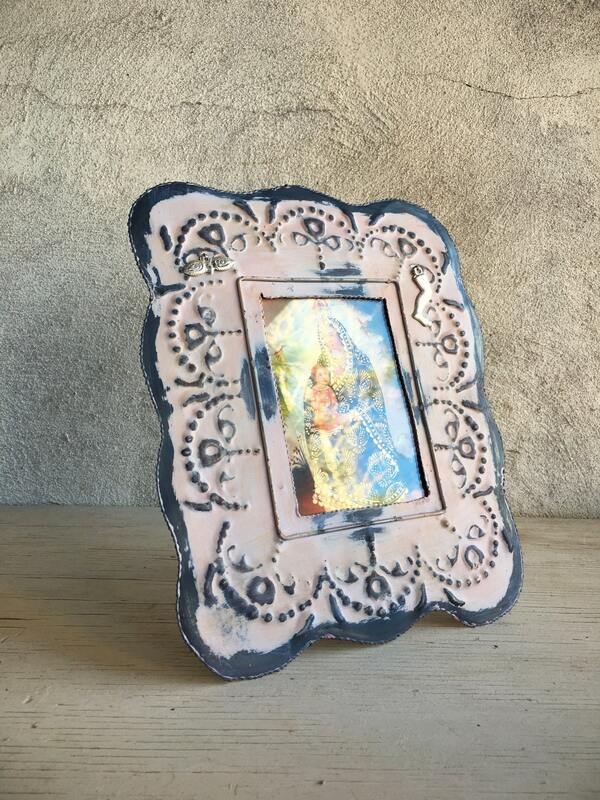 The oil painting on canvas is about 4" wide by about 5-1/2" long, although the opening of the frame is only 3-1/8" by 4-3/4" so some of the painting is hidden behind the metal. Total frame size is about 8-1/2" wide at the widest point and about 10-1/4" long at the longest point. Stand in back. No wire for hanging.